The Merrill Hotel & Conference Center's flexible meeting and event spaces offer expansive views of the Mississippi River. Our location is near Iowa's Quad Cities cities. With Davenport just 29 miles away, short business trips to our own Howe Conference Center are made easy. If you're traveling the 43 miles from Iowa City, The Merrill can accommodate you. Our location makes us an ideal spot for corporate meetings, events, and banquets. And you can trust The Merrill's professional planners to address every detail for a perfect time. The Merrill Hotel & Conference Center is Iowa's only IACC accredited meeting venue located in Muscatine near the Quad Cities. It offers an abundance of natural light as well as scenic views of the Mississippi River. Within the Howe Conference Center there is a combined total of 12,723 square feet across 16 functional rooms. Each space boasts advanced technology, including audiovisual equipment, as well as interactive apps suitable for both guest rooms and business meetings. Plus, you can count on a dedicated conference service planner to ensure every detail is addressed to your liking. Our versatile event space can accommodate small corporate meetings/parties, fundraising events, and social events including weddings. The Merrill Hotel & Conference Center is proud to be the only IACC certified meeting venue in the state of Iowa near the Quad Cities. Our meeting space achieves the standards of what IACC meeting spaces should look like in order to meet the needs of our guests. The emphasis is not only on the quality of our venue, but the outcome of your meeting. With this prestigious certification, we are prepared to deliver unforgettable service and unparalleled connections that will leave a profound impact on guests. Visit our IACC membership page here. The Merrill Hotel & Conference Center is one step ahead of everyone when it comes to planning meetings. With three meeting packages to choose from, our hotel takes the hassle out of planning. Each package is designed to be cost effective, create productivity, and enable you to concentrate on the business at hand. In other words, we do the work for you. Tell us your needs and allow our meeting planners to create a package suitable to your agenda. IACC, the International Association of Conference Centers, is the only global professional association representing small to medium-sized venues focused on meetings, training courses, and conferences. To achieve IACC certification, venue members must demonstrate a commitment to the highest standards in design, facilities, services, technology, and sustainability. As a member, we join a global organization of the most innovative, forward-thinking and results-driven meeting venues in the world. Plus, we are the only IACC accredited meeting venue in the state of Iowa! Through the IACC, we have dedicated ourselves to providing the best possible environment and consistently delivering the best conference service to ensure successful, flawlessly executed meetings. All meeting rooms feature windows with blackout shades; computer hook ups and phone line access; customized conference tables; and special chairs designed to eliminate fatigue. All conference rooms have high speed internet access and have both wired and wireless capabilities. User-friendly control panels within each meeting room allows remote access to all electronic functions – open or close shades, dim the lights and operate projectors with the push of a button. Conference services desk is staff for the duration of your meeting to assist with any special requests. Fully stocked office supply table is set up to provide any items that may have been forgotten. Providing fresh, appealing dining options is a top priority. Breakfast and lunch are served buffet style, and dinner is served at your table or buffet style. Catering menus vary daily and our expertly trained culinary staff will easily accommodate special dietary requests. For more information about our event space or to book your next event, please call our sales professionals at (563) 263-2600 or toll free at (833) 261-2600, extension 7934. The Merrill Hotel & Conference Center uses all sorts of websites to help you find our hotel for your travels to Muscatine, and we want you to know that we will always guarantee the best rate when you book directly through our website or through our reservation team members. If you feel you have found a better rate on another website, don’t hesitate to call us directly at (563) 263-2600, so we can extend our best rate to you. 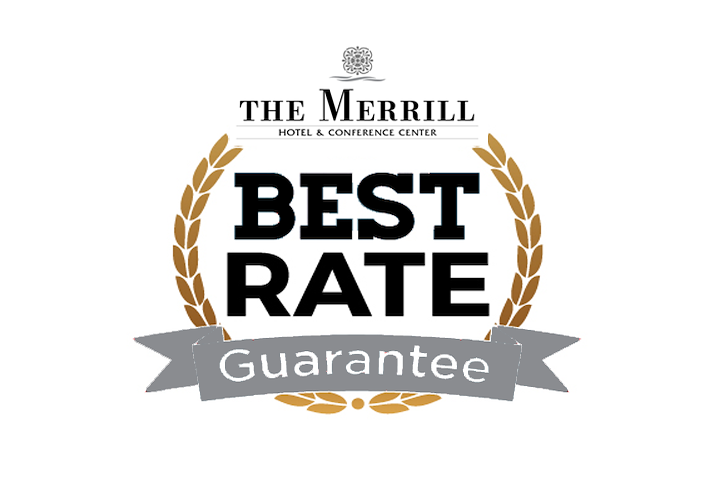 This is our guarantee that working directly with us is always the best way to reserve your stay with us at The Merrill Hotel & Conference Center.